I will not even start my rant on GM, Monsanto, or suicide genes. Trust me it is long! I will instead say that I truly, truly, truly believe in seed saving, open pollinated, heirloom varieties and that the power of seeds should be with the people. I love that there are so many varieties of each fruit and vegetable. I purchase most of my seeds from Diggers, they are a company that holds similar beliefs to my own (refer to non rant above). I have a seed problem, they don’t mind helping out, win-win. I pored through their catalogue again yesterday to circle my wants and square my actual purchase plans. The joy! 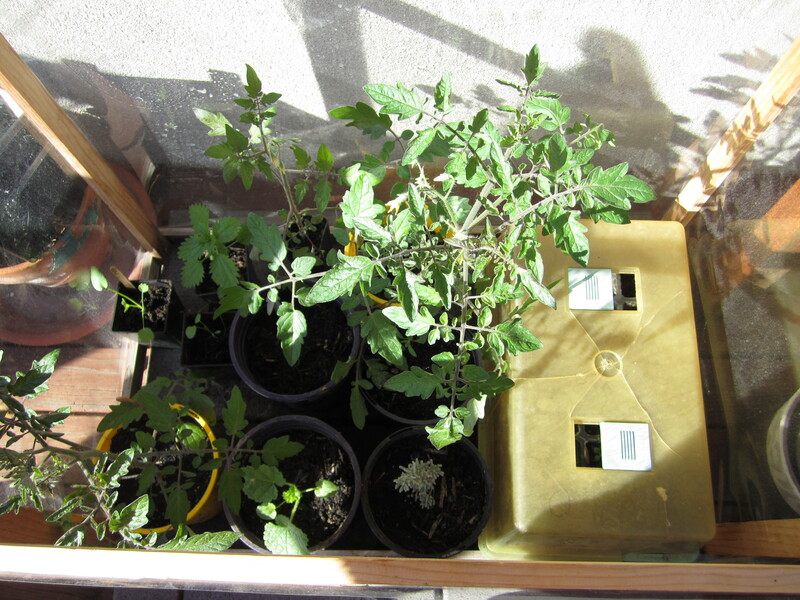 I have a system going at the moment that is a mini greenhouse within a small greenhouse. 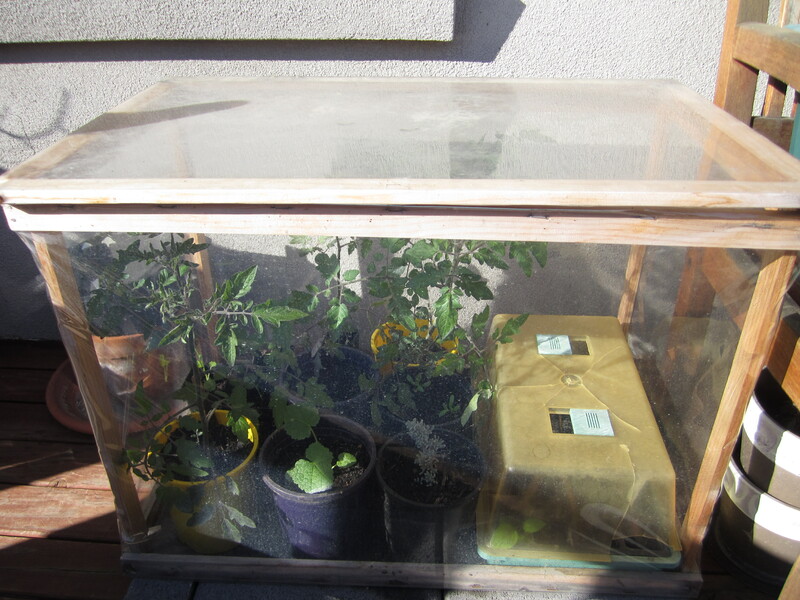 My friend made me the small greenhouse for my birthday a few years ago and it has been great! It gets nice and warm in there. It gets even warmer in the mini greenhouse. This allows me to get my seeds started quite early. Then I move them to the small green house as the start of hardening them off. It has worked quite well for me. I have 24 spots in the mini green house and approximately 700,000 things I want to plant. This is a mathematical nightmare. And so the process begins. 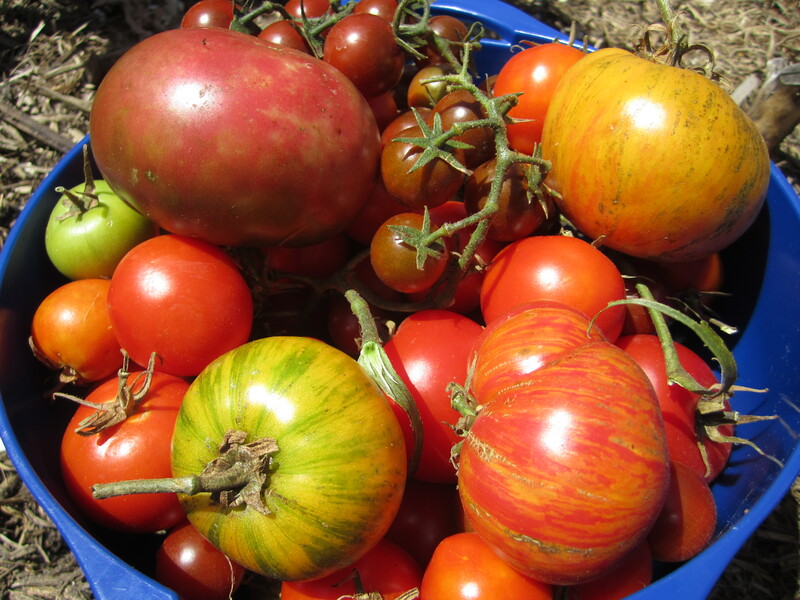 I find it particularly hard to choose just 5 varieties from the 22 different tomato options that I have. The other challenge is melons, I love melons. They take up a bit of space and I can really only really fit 2 in, I have 6 that I desperately want (6 that I already have the seeds for, approximately 100 that I want to try growing). Oh the decisions. I try not to eat food out of season and these are the 2 things that I wait the most avidly for. Zucchini, corn, capsicum, cucumber, beans, etc all nice, all anticipated, but not with the same zeal as tomatoes and melons! Last year during the planning stages for my food garden I envisaged a lovely box or 2 of potatoes, 6 or 7 pumpkins, and some garlic and onions to be my storage foods for the Winter. I planted accordingly (I thought) and succeeded in all areas, although I would say I over achieved in the pumpkin area. I planted 2 varieties, one great for storage and one named the Cinderella pumpkin because they are gloriously red/orange looking picture perfect pumpkins. The good storage one (Queensland Blue) died in a late unexpected frost. So I planted my back up plant, although due to a poor labeling system I was unsure which of the 2 it was. 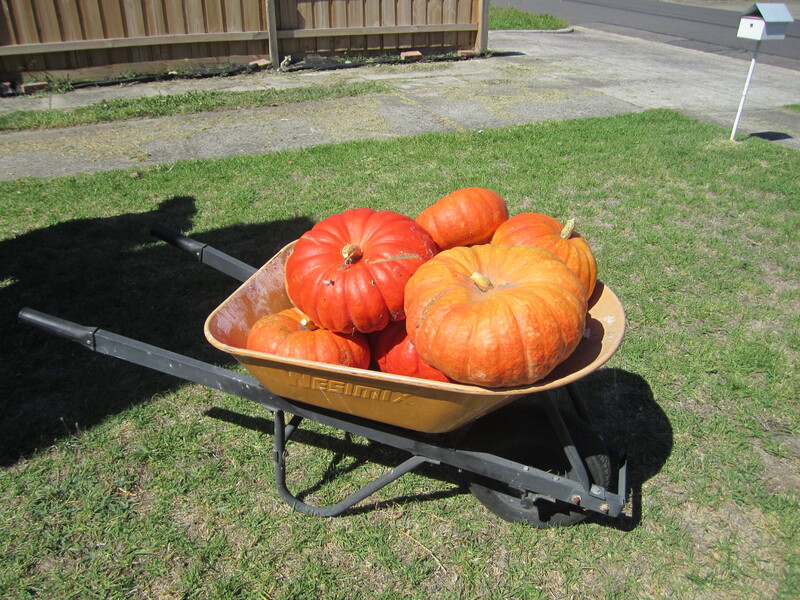 It was the Cinderella one… At the end of the season from 2 Cinderella vines I had 76kgs of pumpkins that don’t store that well. Lucky me! I had 3 wheelbarrows full. As each one started to show signs of going bad I steamed and pureed them and put them in the freezer till I wanted to make pumpkin soup or anything pumpkinny. I have been quite creative with the pumpkin puree, pumpkin scones, pumpkin fruit loaf, pumpkin bread, pumpkin curry, pumpkin pasta sauce, both savoury and sweet pumpkin muffins, pumpkin cake, pumpkin pie, pumpkin risotto, pumpkin has been added to everything here! This was one of the largest ones, weighing in at 16kgs, it was a mammoth job to cut and cook it all. 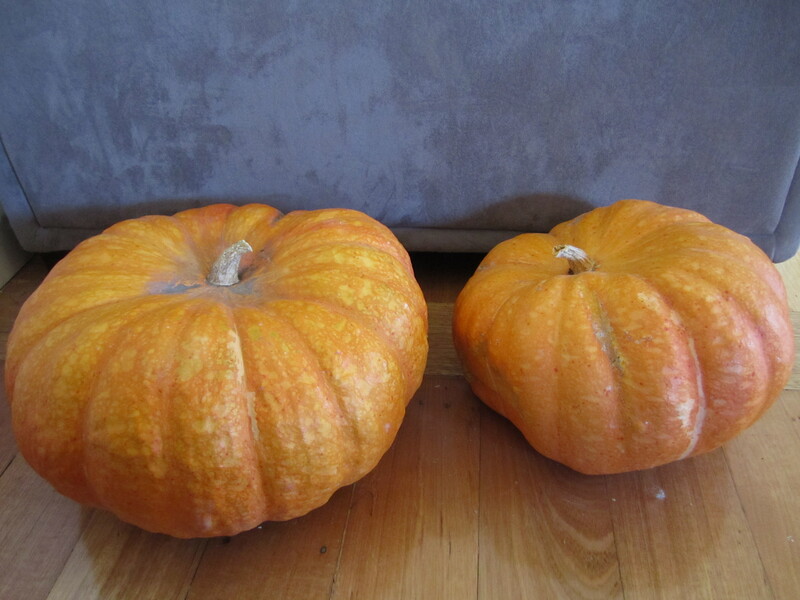 I still have 2 pumpkins sitting in my lounge room, the last 2 left. I am suprised at how many people have asked if they are real. Unusual choice for decoration if you ask me. Lack of appropriate storage space being the actual reason they are there. These last 2 have actually stored really well, for a while there I was cutting and cooking at least a pumpkin a week. Freezer space was an issue! I haven’t had to do anything to these last 2 (except frequent inspections) and they have been sitting there peacefully for months. Yay! 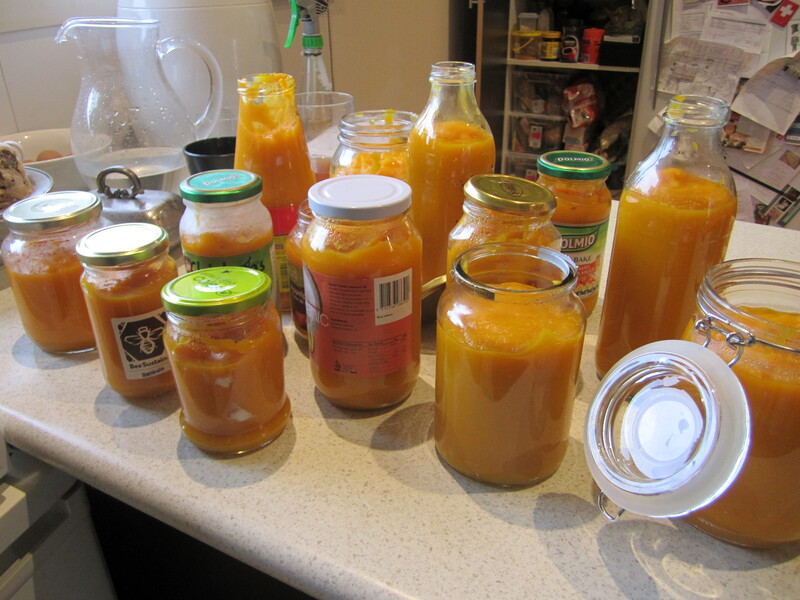 I only have a few jars of pumpkin left in the freezer. I am suprised I have not turned orange I have eaten so much pumpkin. 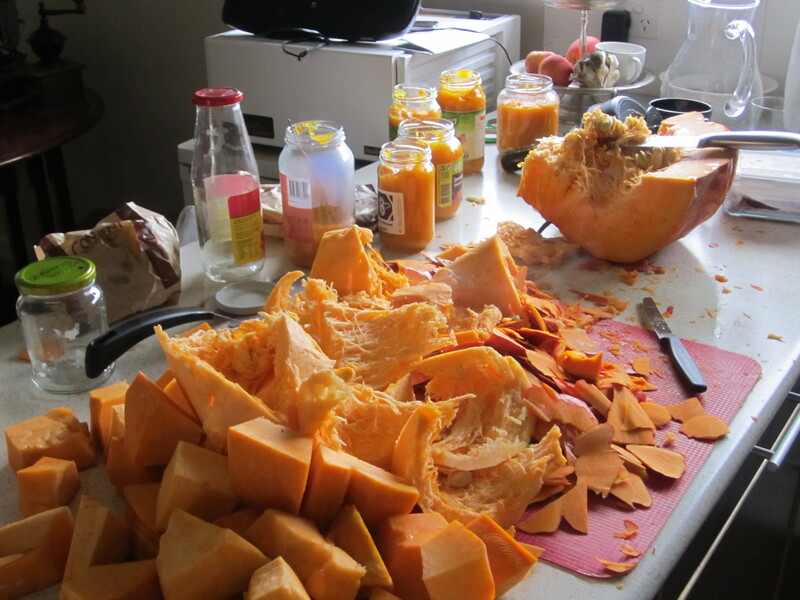 The reason I am pondering all the pumpkin is… It is planning time again! I feel I need to not plant pumpkin ever again, but then I get food shortage fear. So I will not plant this Cinderella variety, I will plant 1 vine of a well storing variety. I think 1 but maybe 2 would be better. Food hoarding, it is real. We are about to enter the last month of Winter. I am pretty excited! 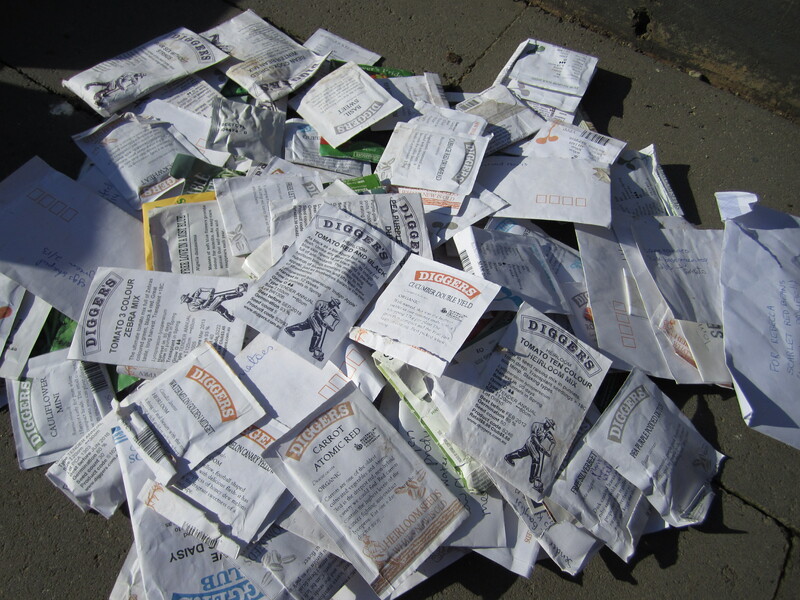 I have started planning my Spring garden, I have laid out all my seed packets and dreamed. I have begun the mental yoga exercises of where to place all the plants that I want to fit in and grow. It looks tight. I am sure that if I had double the space that I do I would fill it easily and still be scratching my head over how to fit it all in. I will write all about what I will plant after each seed variety has pleaded their case and I have decided who makes the cut. Winter for me is a time of staying warm, I really dislike using the heater yet the house is too poorly insulated to be habitable in normal clothing. So to avoid the heater I dress in a kabillion layers of clothes and drink lots of tea. I don’t drink many hot drinks in the other 3 seasons but in Winter I love me some garden tea. I am a smidge sensitive to caffeine so I tend to avoid coffee and black tea, luckily for me my garden provides me with some alternatives. Peppermint, Mint, Chamomile, and Lemon Verbena are my current drinks of choice. I mix them in different combinations depending on what I feel like. I have made the somewhat dubious decision to add Stinging Nettle (a quick spreading weed previously not in my garden) in to the mix. I will reiterate the pro’s that I have listed and relisted a hundred times in my head since planting it. I can use it like spinach, I can make a fertiliser out of it, I can dry it and drink the tea. 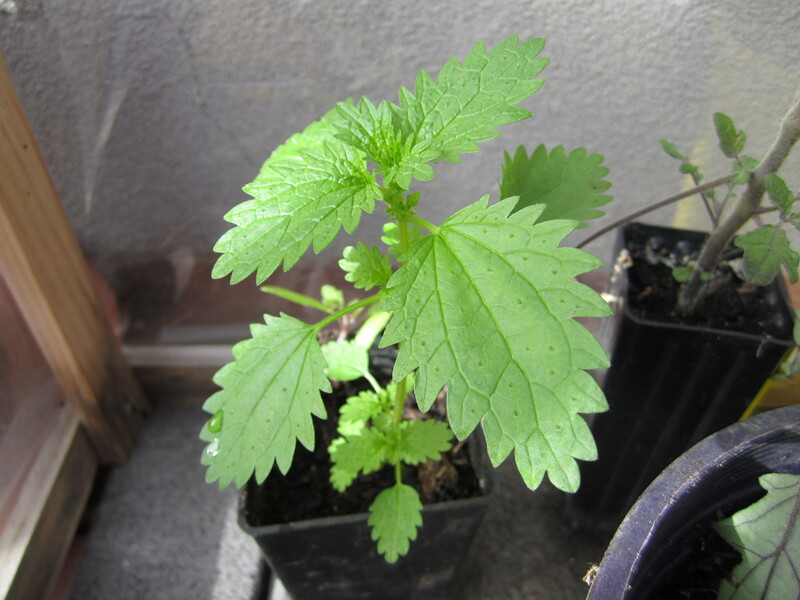 I currently purchase nettle tea so it seems like a financially good idea to introduce it. So i have one plant (weed) in the garden and one for safe keeping in the mini greenhouse. 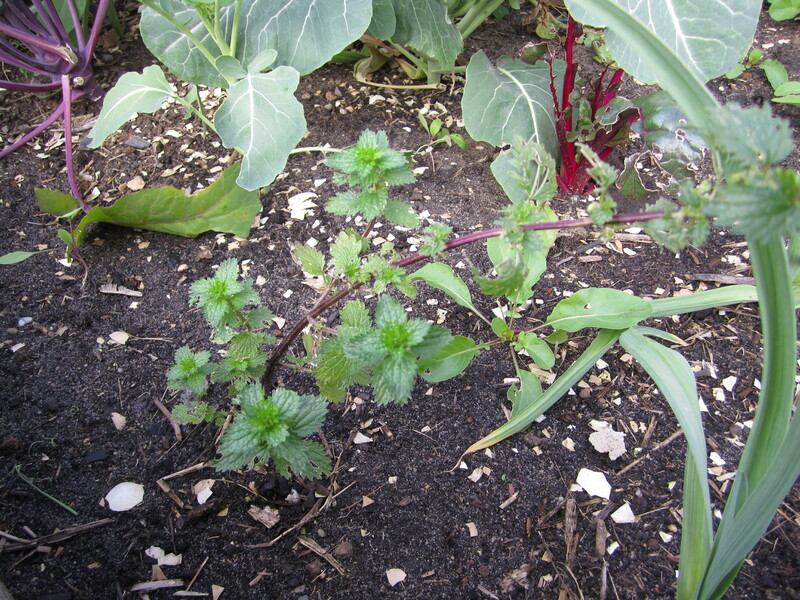 I will add Nettle tea to my garden tea list for next Winter. I have a dehydrator but I don’t use it for my teas. I generally collect them throughout Summer and Autumn and drink them throughout Winter. I cut the flower for the chamomile and the leaves for the peppermint, mint and lemon verbena and lay them out on either a clean tea towel or on some muslin cloth and allow them to dry naturally. Once they are completely dry I put them in glass jars and store them in the pantry. 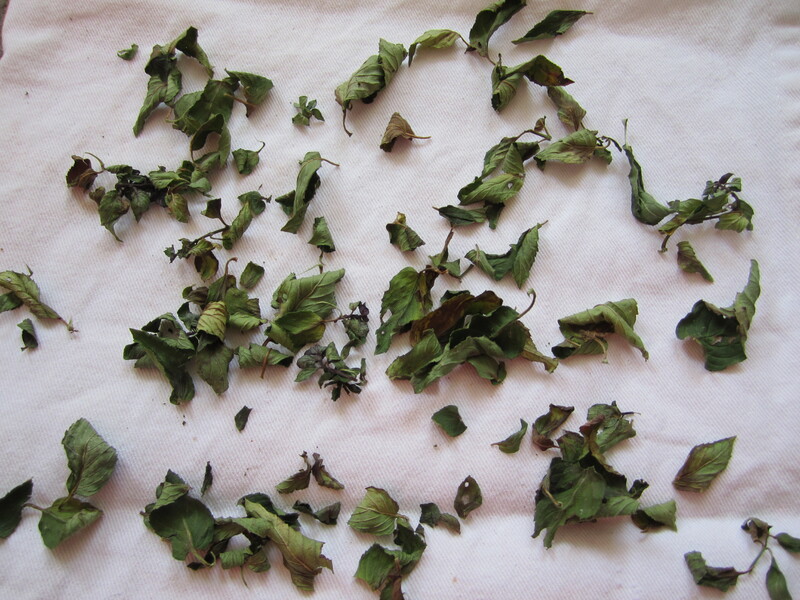 This is some manky looking peppermint that I collected a few days ago after some Winter pruning. It is almost completely dry now. I didn’t actually need any more peppermint tea but I hate getting rid of things I could eat or drink. Food hoarding. Guilty. 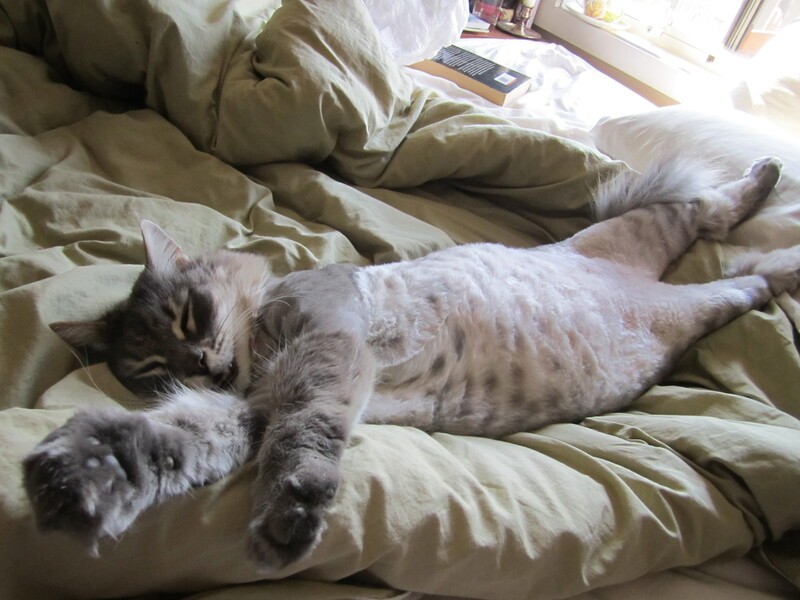 And just because I can, a photo of Herbie in all his glory having what looks to be an epic nap. Taken a few months ago post his shave. I think he is comfortable in his skin. Although I lean towards being a crazy cat lady there are only 2 cats in this house. Herbie and Franklin. One day when I fully accept that I am a crazy cat lady I think there will be 3 or 4…. I like to believe that it truly increases my enjoyment of something if there is a period of absence. This is mostly in relation to food for me. Eating in season creates this all on its own but I like to create arbitrary rules for some specific foods. Hot cross buns can be made in the 2 weeks leading up to Easter in my world. I Love Hot cross buns. I think I could happily eat them every day of the year. But now the smell of the dough rising with that specific mix of spices is a special thing. I look forward to it for months and months. Then I eat a crazy amount of hot cross buns every day for 2 weeks, then I have a break, an 11 and a half month break. Despite this crazy trend (which i am evidently not a part of) of photographing everything one eats I don’t have any photos of the hot cross buns, probably much more interested in timing it just right so that I don’t burn my mouth but the butter still melts. Oh the perfection! 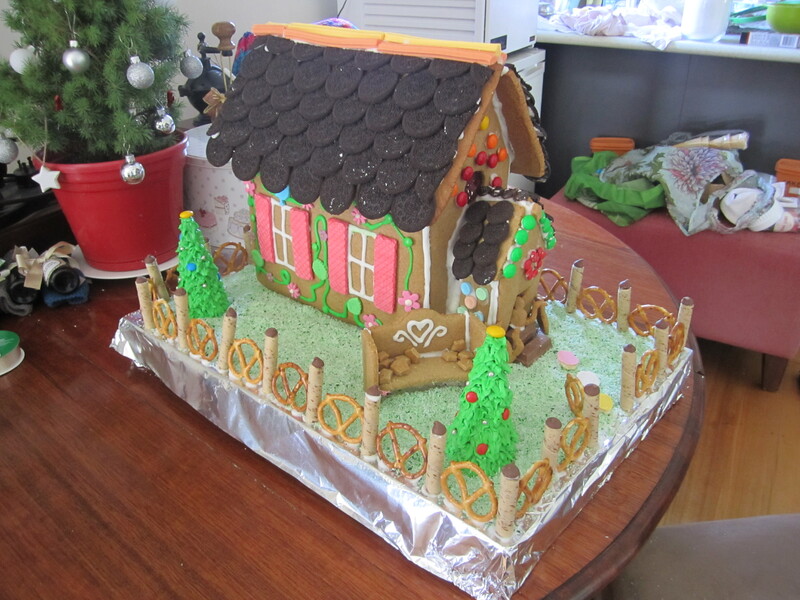 Each Christmas my younger sister and I make a gingerbread house. Each year they improve, each year we learn so much. The most important being that the roof has to be longer than the walls or the roof hasn’t got enough support, there was a lot of structural royal icing that year… There have been so many lessons documented on scraps of paper to read the following year. Upon reading we pat ourselves on the back for writing down the already forgotten wisdom. Yep, I forgot to cut the windows out before baking. Oops! There is still so much room for improvement and it is a mammoth task to undertake but I look forward to it for ages in advance. I don’t generally eat gingerbread any other time of year so it is delicious for at least the first wall. There are a few other things that I meter the joy out on. Mulled wine in Winter is the first that comes to mind. Off to a night market this evening to enjoy some mulled wine. A perk of Winter for me! I love love love my garden! 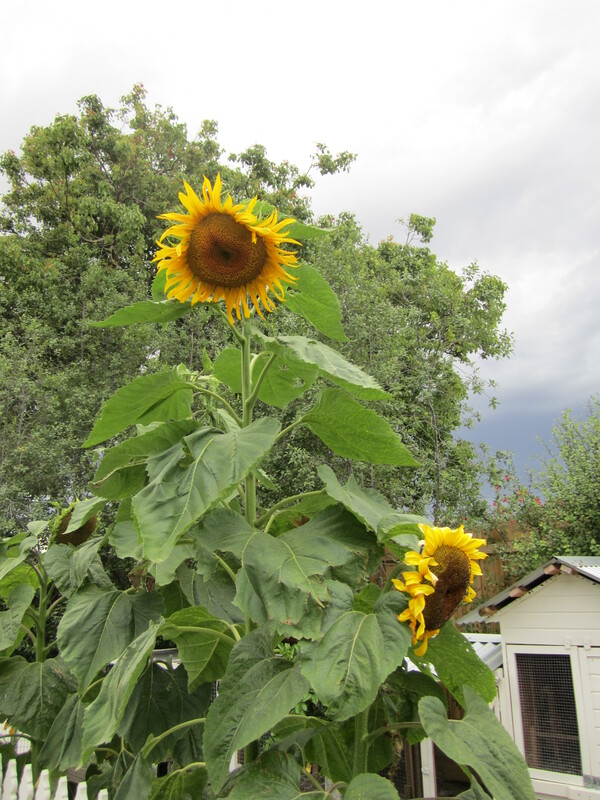 I rely on my garden to feed me and I love food but that is only the start of it. I enjoy spending time outside, I still get a thrill every time a seed germinates. It fascinates me when a seedling becomes a plant that I can eat. I am trying to run a closed loop garden which means no fertilisers or compost or anything really bought in from outside the backyard. This does not address my compulsive seed acquisitions. That is a problem I am working on. My current system is seed saving and only buying new and exciting different varieties when I have finished 2 other packets. Seed saving means I now have more seeds than ever but I am purchasing a lot less. My closed (ish) loop garden means my worms and chickens provide liquid fertiliser which help the plants to grow, the trimmings and old plants plus lawn clippings go into the compost (or back to the worms or to the chickens as supplementary food) which turns it all into glorious rich dirt which then goes back into the garden and nourishes the plants so that the cycle can continue. I aim to have all my fresh produce coming directly from my garden, I am about 85% of the way. The fruit trees produced their first fruit this year (8 apples, 6 of which the Sulphur Crested Cockatoos ate about a week before they would have been ready to pick, so very far from impressed and 1 Feijoa) so fruit (apart from melons which I grow myself in Summer) is something I am still purchasing at the farmers market. I also do not grow mushrooms (yet!) so I purchase those from my favourite mushroom man. The only other times I need to make purchases from the farmers markets are when I have people coming over that I did not plan for and cannot harvest enough food to feed them. Winter is my least favourite gardening time, everything grows so much more slowly, there is no need to perform multiple tours of the garden a day as nothing changes very rapidly. I love that you can see the growth in a single day in Summer. Amazing! So here are some somewhat less exciting than Summer Winter garden photos. 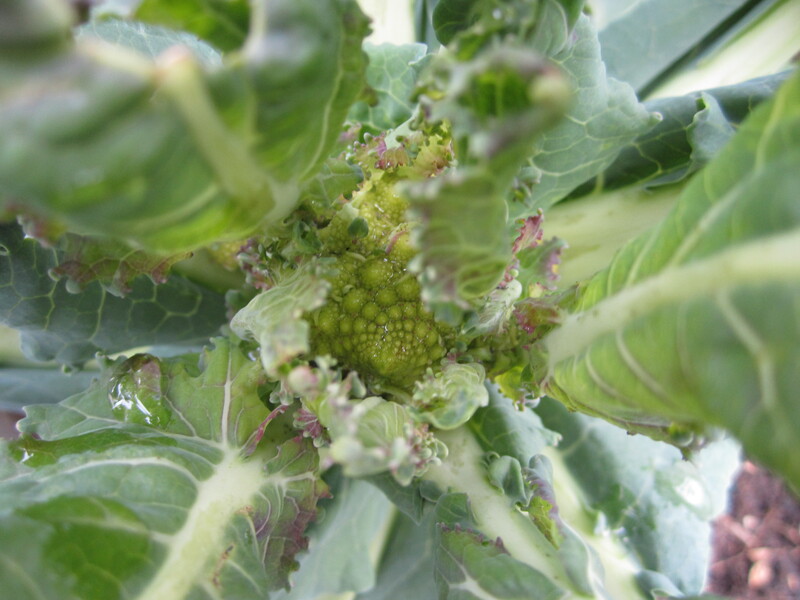 This is the first time I have grown Romanesco Broccoli (one of those coveted and finally purchased new and exciting [to me] different varieties) it is just starting to form. 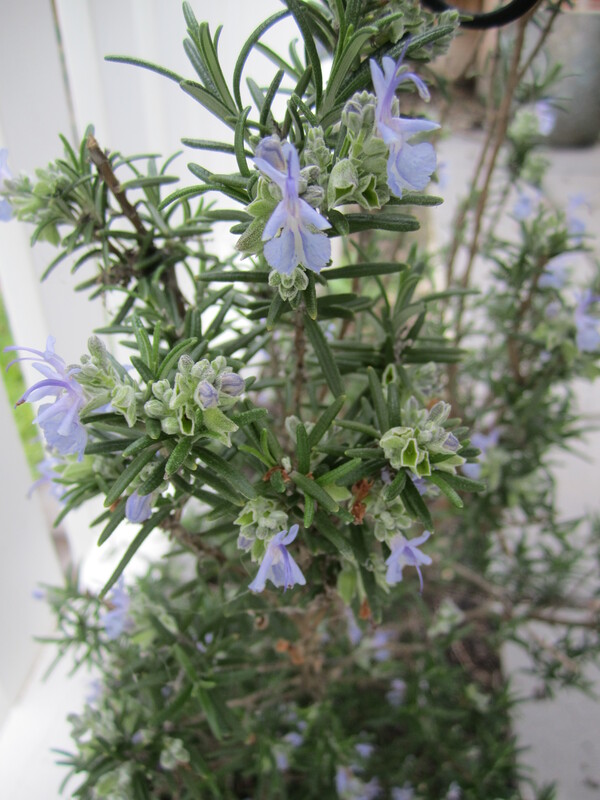 Blooming Rosemary, always a delight, roasted potatoes are just not the same without it. 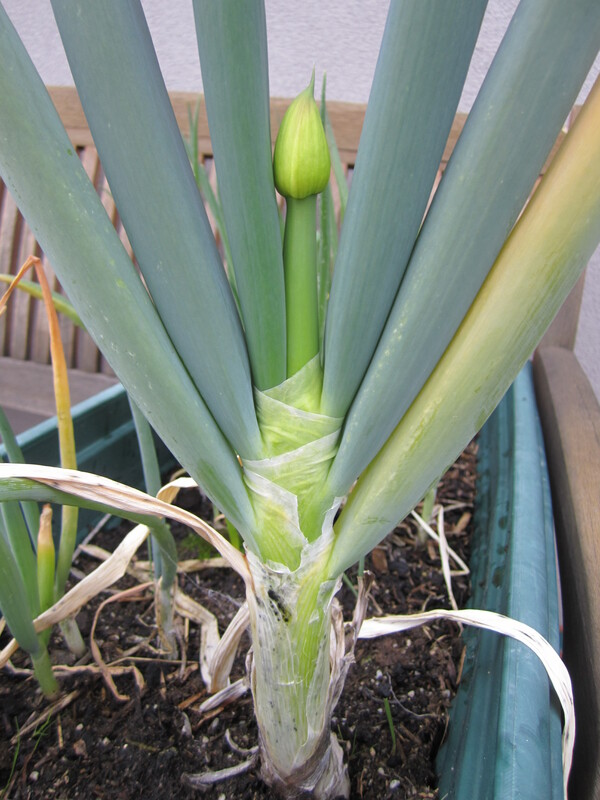 I have been waiting (slightly impatiently) for this mammoth spring onion to go to seed. It is finally ready to flower. 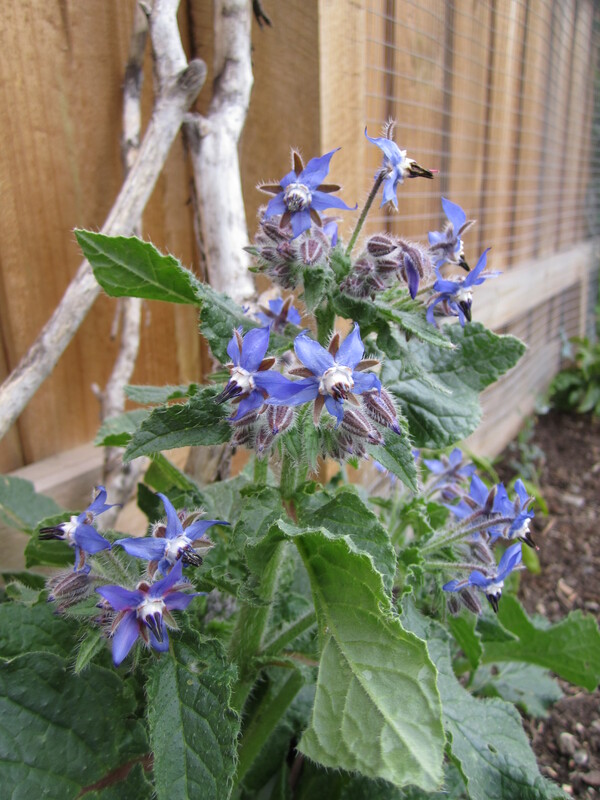 The Borage has just begun blooming, when the bees find it they will be so happy, they adore Borage. 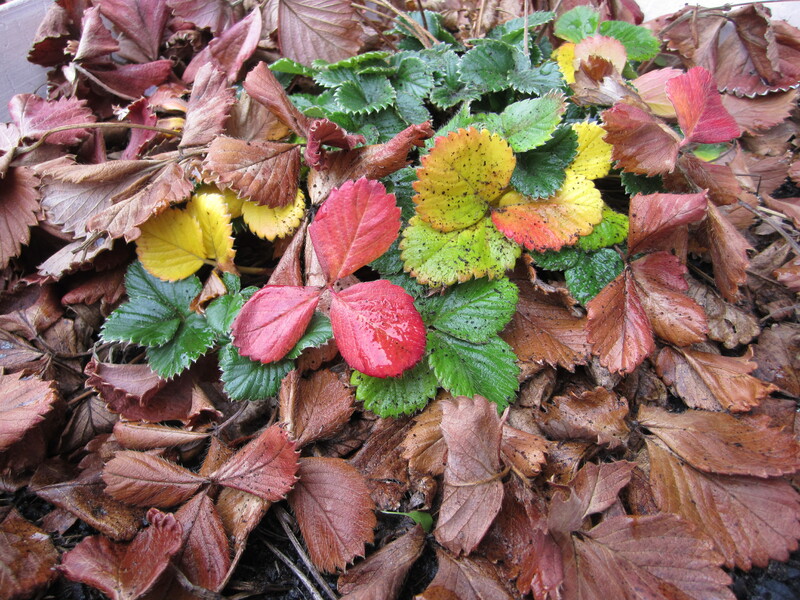 The many beautiful colours of a strawberry plant that desperately needs attending to. 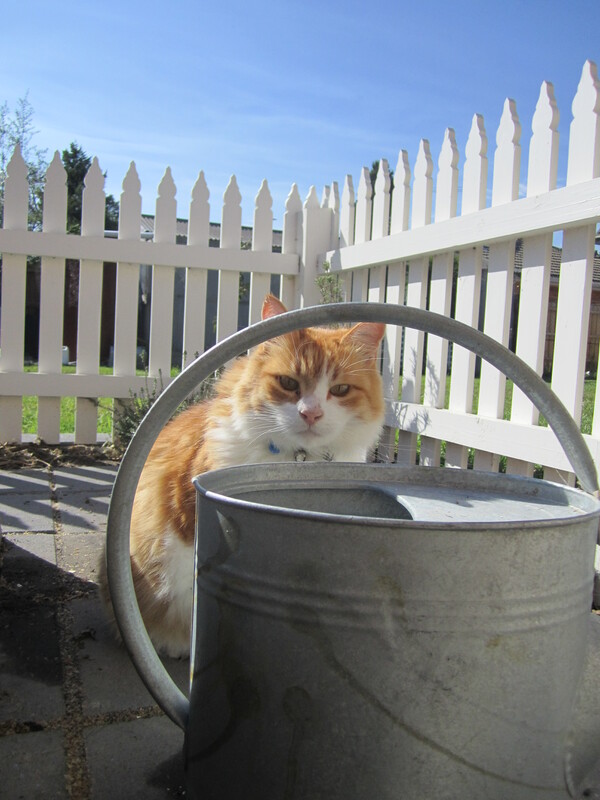 And finally, my gardening helper. 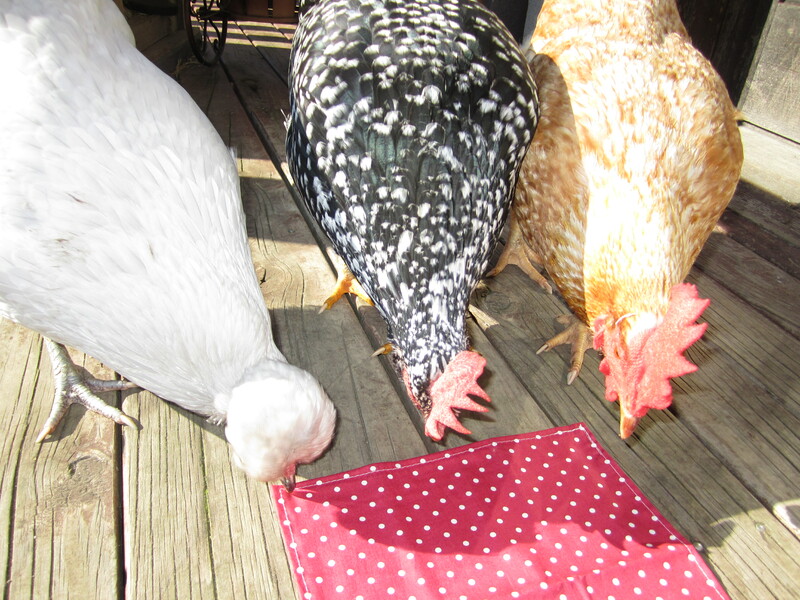 I also had my chickens displaying avid fascination in what i was doing. This one is also no longer for sale. Despite not having a goat, there are still a few animals on this suburban block. 2 cats, 5 chickens, and approximately 10,000 worms. Once I convince a few people there will be a bee hive too. The 2 chickens not in the photo are rarely up on the verandah, Maggie is disabled and only has one working leg, as a hopping chicken she does not take on stairs. Bella feels the top step resembles a sheer drop from a massive height, once up the normal sized stairs she feels trapped and takes around 3 to 4 minutes of attempts to finally go down the top step. The other 2 steps pose no problem to her. I seem to attract weird animals with very strong personalities. 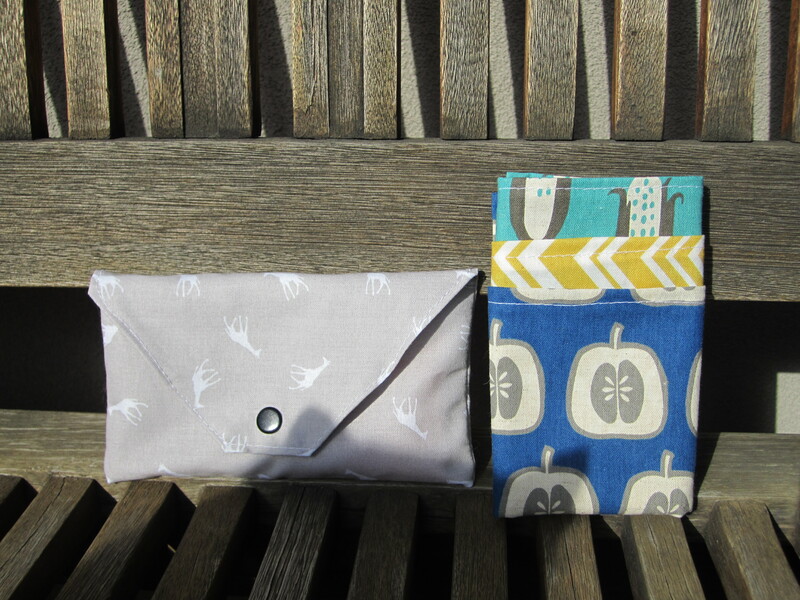 Exciting news (for me), I opened the Etsy shop last night. I think I can expect fame and fortune any time from now. I’ll keep you posted….